Tufts Paws for People employs therapy animals as motivators to get employees—and others—to exercise more during business hours. 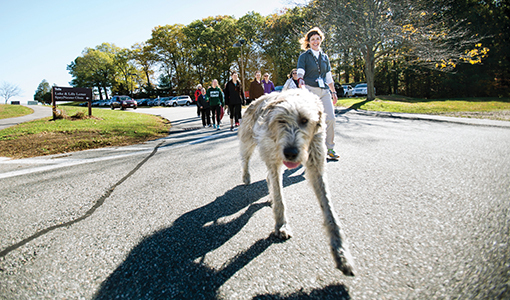 After Irish wolfhound Einstein passed the 22-part skills and aptitude test to become a registered therapy dog and a member of the Tufts Paws for People animal-visitation group, his human companion, Professor Lisa Freeman, couldn’t wait to get him out working. Because the still-growing rescue dog is big and clumsy, he’s not a great fit for working with elders or kids, said Freeman, J86, V91, N96, who has volunteered for Paws for People for ten years and serves on its board of directors. Fortunately, a few volunteers from Tufts Paws for People recently had attended a conference run by Pet Partners, the national therapy animal organization of which Paws for People is a community partner, and learned of the new Walk With Me program, developed in response to the U.S. Surgeon General’s Call to Action about walking for better health. While Grafton’s rolling vistas seem made for strolling, the program will soon add a more urban location, said Debra Gibbs, the program coordinator for Tufts Paws for People and a veterinary technician at Cummings Veterinary Medical Center. Although an official start date isn’t yet set, the program plans to soon launch Walk With Me at Tufts Medical Center for both hospital staff and Tufts medical students.